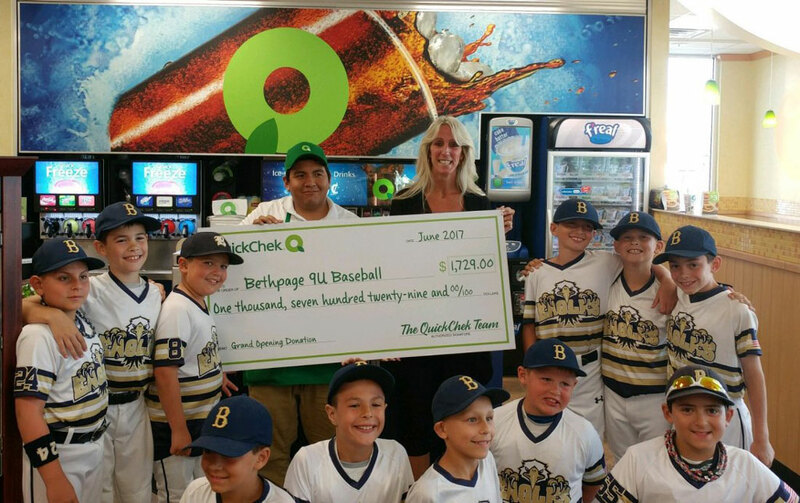 BETHPAGE, NY — Dedicated to the communities it serves, QuickChek has donated $1,729 to the Bethpage Youth Baseball. The fresh convenience market chain celebrates the opening of every one of its new stores by donating a portion of its sales of every sub, sandwich and wrap sold during the store’s first 30 days of operation. Its commitment to giving back was one of the reasons it was named the 2016 National Convenience Store Chain of the Year. QuickChek District Leader Dawn Carmichael and Store Leader Anthony Tito made the presentation on June 26 in the new store located at 3965 Hempstead Turnpike. It is the company’s first store in Nassau County. “We look forward to being a great neighbor, offering those who live and work in the area the quality, convenience and friendly service we’re known for,” said QuickChek CEO Dean Durling, whose family-owned company has been named one of the most generous by New Jersey Monthly magazine. Known for being fresh and local as well as for its coffee which was voted best in America in a national consumer survey by Technomic in 2014, the company opened the new 5,868-square-foot store on May 2. The Bethpage store is open 24 hours a day and features touch screen technology enabling consumers to create delicious custom-made oven-toasted subs, sandwiches, wraps and salads made with the freshest ingredients and personalized hot and cold beverages exactly as they want them, any time of day or night. Amenities include no-fee ATMs which provide additional added value to consumers; indoor seating for 13 people and outdoor seating for eight; six gasoline pumps offering 12 positions for high-quality fuel at value prices; and 39 parking spaces. QuickChek’s opening will have a positive impact on the local economy. The new store created 40 new local jobs, including eight management positions, and will generate approximately $1 million in tax revenues. It also revitalizes a long abandoned site at the intersection of Hempstead Turnpike and Route 107. QuickChek operates 149 fresh convenience market store locations, including 63 with fuel and 10 with pharmacies, throughout Long Island, the Hudson Valley and New Jersey. The company has raised millions of dollars for a variety of local causes benefiting children, families and military veterans and supports 150 youth sports groups throughout the metropolitan area. To learn more visit www.quickchek.com. Dedicated to the communities it serves, QuickChek has donated $1,729 to Bethpage Youth Baseball. The fresh convenience market chain donated a portion of its sales during the first 30 days of the opening of its new store in the hamlet. Pictured (back row) QuickChek Store Leader Anthony Tito, District Leader Dawn Carmichael, and members of the Bethpage Youth Baseball teams.